Top 10 Best Comedy Movie Lines from Classic Films: These are the top 10 best comedy movie lines from Classic Films, the winners listed in chronological order in a list determined by Turner Classic Movies (TCM) in 2010. You've probably heard many of these memorable lines that have made their way into everyday conversations. 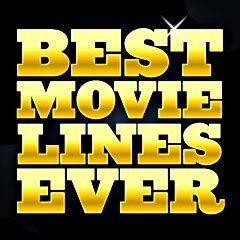 See also the Top 10 Most Famous Movie Quotes according to the Guinness Book of Film, the Top 10 Best Movie Lines Ever according to Odeon Cinemas, the Top 10 Greatest American Movie Quotes, according to AFI, and Filmsite's own Funniest Movie Quotes. 1. "It must have been tough on your mother, not having any children." 2. "You can't fool me! There ain't no sanity clause!" 3. "What do they think I am? Dumb or somethin'? Why, I make more money than - than, than Calvin Coolidge! Put together!" 5. "Gentlemen, you can't fight in here! This is the War Room." 6. "Listen, strange women lyin' in ponds distributin' swords is no basis for a system of government." 7. "What? Over? Did you say 'over'? Nothing is over until we decide it is! Was it over when the Germans bombed Pearl Harbor? Hell no!" 8. "Joey, do you like movies about gladiators?" 9. "It's good to be the king!" 10. "I'll have what she's having."